Array Architects’ technology division, Array Analytics, an innovative Software as a Service (SaaS) solution provider for the healthcare industry, has partnered with Esri, a global market leader in geographic information systems (GIS), to accelerate product development and significantly expand its market presence. Healthcare systems will find this geospatial solution to be instrumental in their strategic planning efforts. As speed to market is critical to long-term success in the new healthcare economy, Array has invested in the creation of a GIS SaaS platform to provide clients with a decision support mechanism that enhances its facilities and master planning deliverables. With deep data wells and a unifying platform, healthcare clients can identify the most influential variables and trends, allowing quick and confident reaction times to changes in the industry. Through prescriptive modeling techniques, Array’s GIS platform will enable healthcare clients to perform real-time analysis to test potential investments, optimize market strategies and project the potential impact to their system and to the communities they serve. Yet another significant advantage to Array’s GIS solution is the ability to leverage 3D models. Today, many healthcare design and construction projects are delivered using 3D models. However, these models most often are not leveraged by the organization beyond a design and construction project. With Array’s GIS platform, healthcare clients can now begin to bridge the divide between strategic and facility master planning; design; construction and operations. Imagine a GIS cloud platform strategic planners can use to continually confirm their planning assumptions through the provision of near live data. It also enables facility directors to have entire real estate portfolio asset data (both owned and leased) linked to the health system’s strategic plans, represented by 3D models, containing all of the facility and real estate information used to manage that asset and the wider portfolio, both on the cost and revenue side. Then imagine the strategic planners and facility directors being able to use the same platform to foster interaction and inform strategic discussions, to respond to real estate market trends and use predictive analytics to anticipate those trends and optimize their real estate strategy. With a GIS platform, teams can impart spatial perspectives to tabular data. As a result, a healthcare organization’s data becomes much more useful, accessible and valuable to the entire enterprise. “GIS could be the elixir healthcare systems need to finally unify the massive amount of data they both create and consume in serving their communities,” stated Array’s CEO, Carl Davis. Array is recognized as a leader in healthcare facility design, consulting and technology offering a full complement of knowledge-based and data-informed services including planning, architecture, interior design, transformation and asset advisory from eight office locations. Our design process uses Lean as a foundation for a unique Process-Led approach; our deliverables use data and technologies for leveraging real-time clinical and real estate market trends required by today’s healthcare organizations. Array’s devotion to a healthcare-exclusive practice springs from our belief in the power of design and technology to improve patient outcomes, maximize operational efficiencies, increase staff satisfaction and provide remarkable results for our clients. 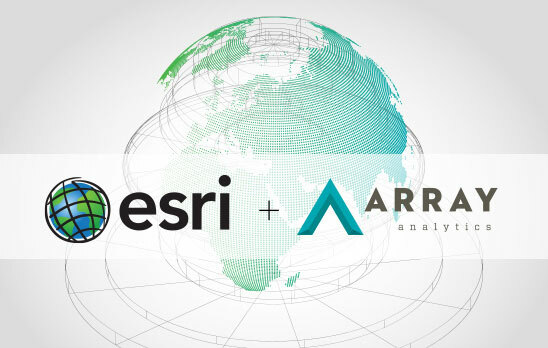 Array Analytics partners with Esri to accelerate product development. GIS could be the elixir healthcare systems need to finally unify the massive amount of data they both create and consume in serving their communities.